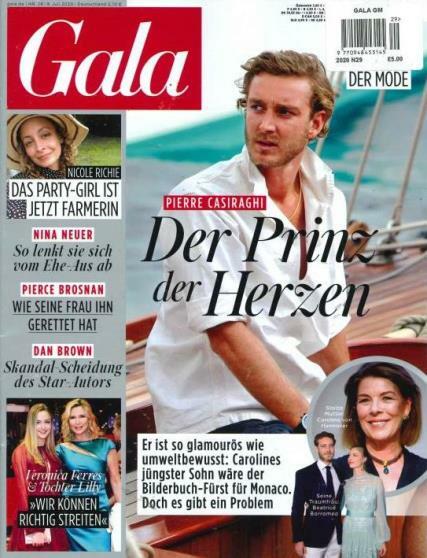 Gala (German) is a celebrity magazine that includes celebrity photographs, celebrity news items, interviews, and gossips. Gala German is known for high quality journalism and Gala German publishes only celebrity interviews of the best quality. Buy a single copy or subscription to Gala German magazine. Want to know about the best restaurants? Read Gala German and see fantastic spas where you will be pampered and look at spreads from the best celebrity parties and their interactions with spas and salons. It is printed on large, glossy paper and has a reputation of being a high end magazine that has celebrities as subscribers. Every issue of Gala German features fashions that you wish you could wear. Find the buying guide in the back of the magazine to discover where the best places to find fashion and beauty products are. Great photographs present before and after photos of makeup and hairstyles. There are advice columns that help you with your fashion questions - all designed to help you look like a celebrity.